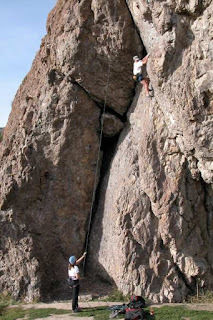 I was on an a morning rock-climbing jaunt at Heise Hot Springs when the Teton Dam broke on June 5, 1976. 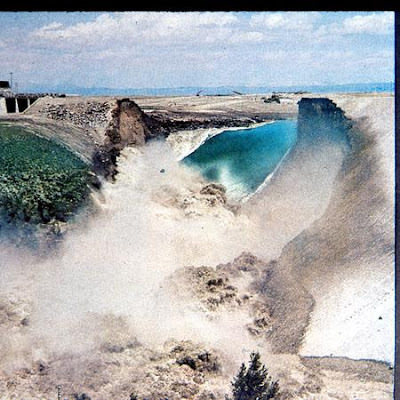 Some time that morning, the as the breach in the Teton dam began to manifest, observers had raised the alarm that the dam was in danger of failing. A couple of Caterpillar operators had tried to push dirt and rocks into the breach, but were swallowed up by the growing chasm. The men escaped, but the bulldozers were swept into the gulf and lost forever. 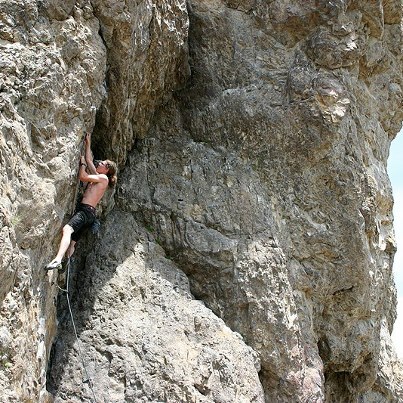 On returning from the rock-climbing, we noticed that the Rexburg radio stations were no longer on the air. We had no inkling of the flood. As we stopped at a convenience store on the road back, we overheard a number of people telling each other flood stories. We still had no suspicion about what had taken place while we were out of town that morning. As we approached Rexburg on the highway, it was a bit of a shock to encounter a farmer wearing bib overalls and hip waders, and wielding a shotgun, standing in the road blocking the way into town. We tried to explain that we were students at Ricks College, and we lived in Rexburg, but he insisted that the way was covered by the flood, and he would not let us pass. We turned around and followed the dirt back roads into Rexburg, approaching through fields above the town. As we came over a rise, it was apparent that the story was no exaggeration. The vista across the valley was a virtual lake. At the transition to pavement we encountered a massive traffic jam of vehicles, driven by people from Rexburg who had gathered there, fleeing from the flood. 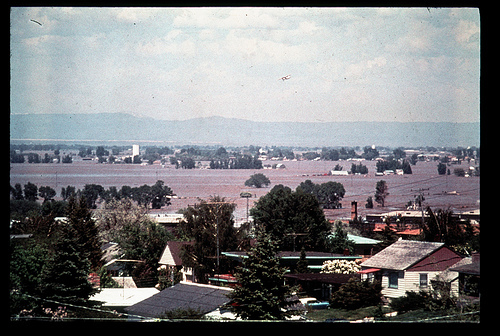 The Ricks College campus is built on the slope overlooking the valley, and was not flooded, but the water spread far and wide through downtown Rexburg and other smaller towns across the valley. I left off my passengers at the Ricks College student union building, and attempted to travel across the main highway on the west side of town to reach my apartment. As I approached, the water was beginning to recede. Crossing the highway in my old Ford pickup, the water just reached up to the middle of the doors. That summer I had been staying in a basement apartment in the home of Dr Sam Brewster on the southwest end of town. We had been working together on an agriculture research project. I forged through the swirling floodwaters and approached the home, just as the water began to ebb. As I approached the home on the mud-covered roads, everything else appeared to be normal. But as I drove up, I saw that the driveways and sidewalks were buried deep in the slick silty mud deposited by the flood waters. I opened the garage door of the house, and went inside to inspect the basement. The entrance to the basement was completely filled to the top with water. It looked just like a muddy swimming pool. I descended a couple of tentative steps down into the water, but to my consternation found it to be freezing cold. As I stood there knee deep in the water, I could see my breath steaming out in the frigid air. I quickly retreated. 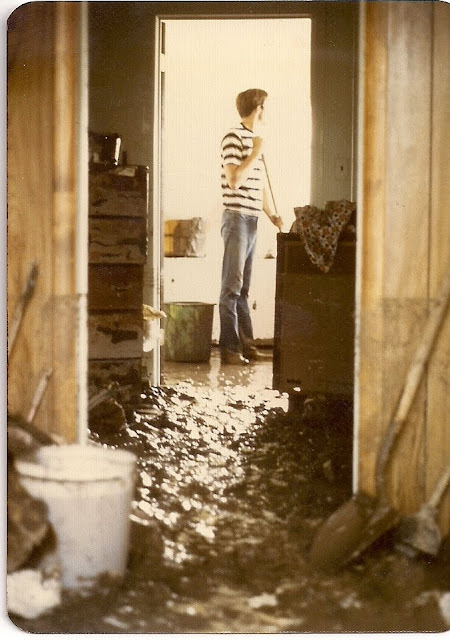 By this time, most of the flooding around the house had receded, and I made my way through the deep mud into the back yard to see if I could get into my apartment through the basement windows. All the windows were covered from within by the pool of cold brown muddy water. I managed to pry one window opened, and out flowed a great surge of muddy water. Along with the water, a number of my soggy muddy belongings also surged out into the back yard mud, books and clothing and bed sheets, all wadded up in a sodden, muddy mess. I gave up on trying to salvage anything of my belongings at that moment, and decided to instead begin work on clearing away the slimy mud that was covering the driveway and sidewalks. I located an old snowshovel in the wreckage of the garage and began attempting to shovel some of the mess out into the street. Right about that time, Sam Brewster drove up. He expressed great relief on finding me well, as I had been out of contact since the flood hit. We started in on trying to clean things up. It was a horrible mess, with all that stinking mud, and we wanted to shovel it off before it started drying. Anyway, after our initial cleanup effort I went back into town and talked to Doc Lowder, one of the Ricks College professors. Doc said I could move back into the Delti Phi house where I had been staying earlier. It was on higher ground and had escaped the flood. So I had a place to take a bath and sleep. The next day was Sunday, but I had no clean clothes to wear to church. All I had was the filthy stuff I had been wearing to clean up the mud. I went up to the Ricks College gym building, and they had a big collection of donated clothing, so I rummaged through it and found some trousers and a clean shirt to put on. As I later found out, President Eyring, who was then president of Ricks College, had taken steps to mobilize disaster relief efforts from the Church. 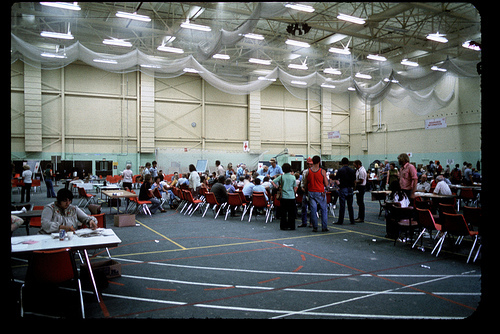 He also opened up the facilities of the Ricks College campus for victims of the flood to take refuge. The cafeteria began serving meals to flood victims, and continued for several months. As I recall, we had a very short Church meeting, and the branch president encouraged everyone to go out and do what they could to help the cleanup effort. Also that Sunday, the phone company had set up a bank of emergency phones on the Ricks campus, and I was able to call my parents in southern California to assure them that I was okay. They had seen the news about the flood, but were unable to call and find out what was going on, because all the phone service had been discontinued with the flooding. I asked them to find a pump to send that we could use to drain basements. They found one right away, and my brother Tom travelled to Rexburg the next day to help us empty out basements all over Rexburg. We spent the rest of that summer helping to clean up the mess. After my brother arrived with the pump, we started working on draining out basements. My older brother's wife Valerie was from the Hibbard area northwest of Rexburg, and she asked me to try and drive out to Joe and Erna's place in Hibbard to check on them, since they had no phone service and no way to communicate. I drove out the highway that heads northwest out of Rexburg toward the Hibbard area, and found part of the road obstructed by houses that had been lifted off their foundation by the flood. After threading through the houses sitting in the middle of the road road, I approached the crossing of the Teton River. It had been scoured bare by the surging flood water. There were no standing trees or vegetation left. I bounced my pickup through the maze of cobblestones across the bare river channel. What had been a peaceful quiet flowing small stream of water now seemed to be something like a half mile wide. 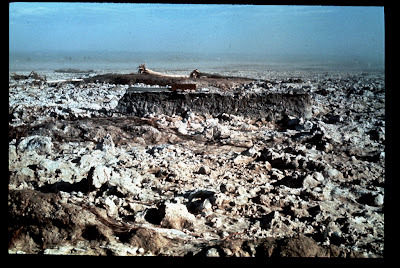 After crossing the denuded river bed, I arrived in the Hibbard area and higher ground. 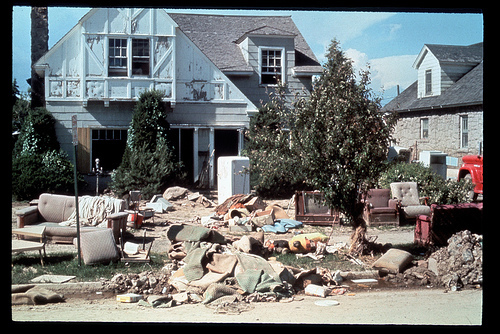 Joe's house appeared to be untouched by the flood - it was high and dry. As I drove up to the house, Erna was out trying to water her flowers from a watering can, and Joe was in the garage frying up meat on his Coleman stove, because the power had been out there since the flood, and all the food from their freezer was thawing. Anyway, Joe said they had climbed up onto the roof of the house to watch the flood. The waters had parted around them, so their little neighborhood was a virtual island. But they were doing just fine. Flood cleanup efforts continued. 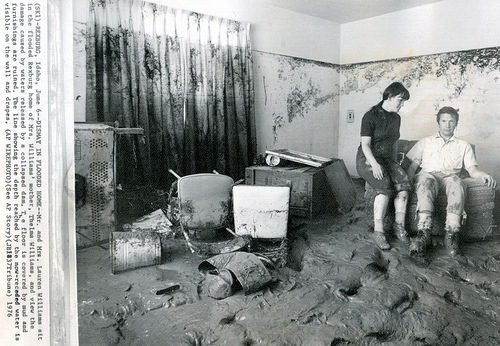 Dr Brewster's basement was pumped out and the mud scooped up. We set up a little reclamation station on his driveway, with Wilma running the hose trying to wash off the mud from items we were retrieving from the basement. Initially we tried putting some of the washable stuff through the washing machine, but the mud proved too much for the laundry, and we abandoned that effort. Sam's academic book collection was not salvageable. 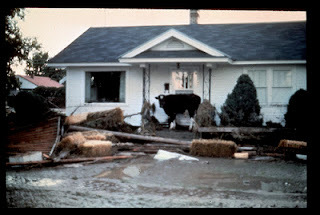 The Bureau of Reclamation flood relief team recommeded to the people of Rexburg that floodwater contamination was likely to have spoiled all home-canned preserves, so we discarded hundreds of bottles of food that had been so laboriously prepared by Wilma. There was also tons of food storage wheat that had been in the basement, and was spoiled by the flood waters. Most all of the children's toys had been in the basement, and were ruined by the muddy water. Of course all the major furniture was ruined and beyond salvage. 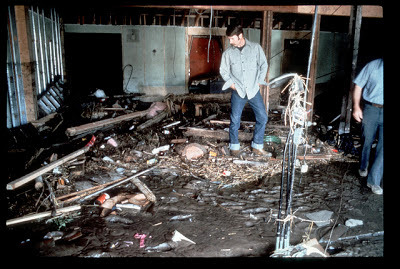 The water in Sam's basement had just lapped at the ceiling in most places, so none of the upstairs part of the house was too damaged. But all the sheetrock in the basement was ruined by the muddy water, and had to be ripped out. When we finally had everything cleaned up and torn down to bare studs, there was one final insulting reminder of the flood. Turns out, the flood had carried silt and gravel into the sewers throughout Rexburg, and the sewage was no longer being carried away. Enough sewage backed up through the connection to the house that it began flooding out of the plumbing opening for the toilet that had been there. Raw sewage began gushing out in a stinking geyser, and flooded the basement with several inches of filthy standing water, and other things the sewage brought. We reported the problem to the city, and they sent a vacuum truck to clean out the local sewer connections in the neighborhood the next day. As we continued to work on recovering Sam's basement, I eventually had a bit of time to spend ranging around and exploring the area. 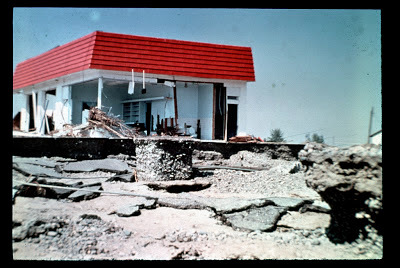 I was amazed and dismayed at the devastation. 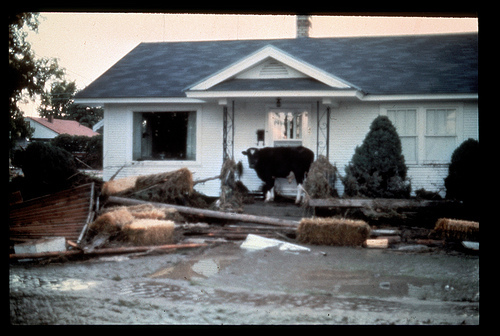 Prior to the flood, one of the people I had befriended in the Rexburg area lived on a ranch just northeast of town. It was a family with all daughters that for some reason had a number of horses that the girls would no longer ride. I spent a number of weekend afternoons on that ranch, helping exercise the horses for them. After the flood, I took a trip up to that area to see what had become of them. It was as if the face of the earth had been scoured clean. 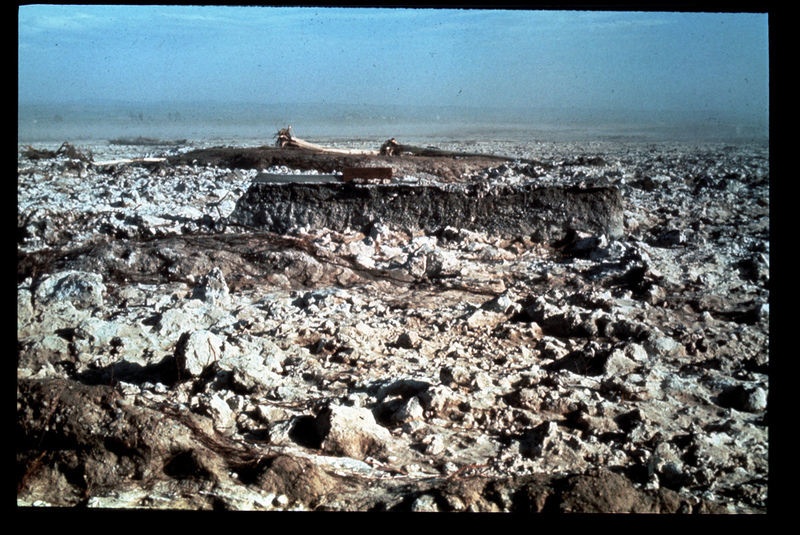 There was no trace left of the ranch house or barns, not even foundations to be seen. I never found out what happened to those people. Throughout Rexburg, people had lived in their basements for years. 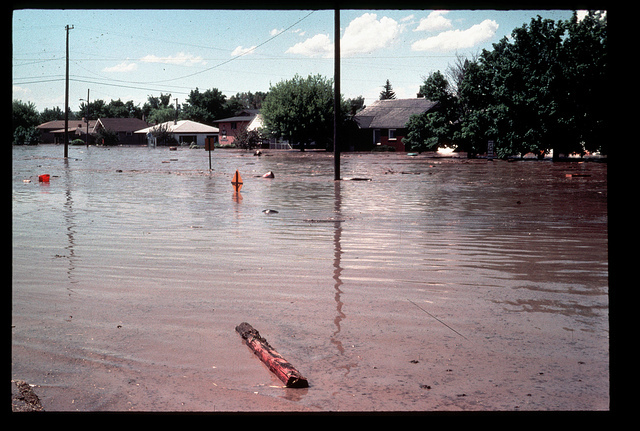 The floodwaters made a wreck of many homes in just a few hours time. 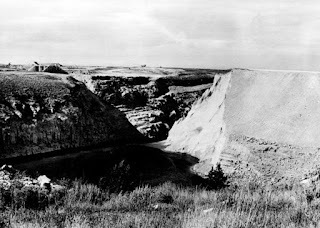 On the north end of Rexburg, there had been a sawmill on the banks of the Teton River. 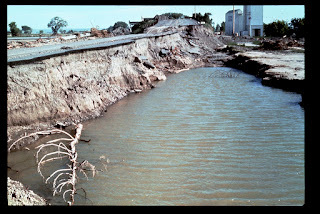 Much of the flood damage sustained in that area resulted from sawlogs that drifted on the surge. 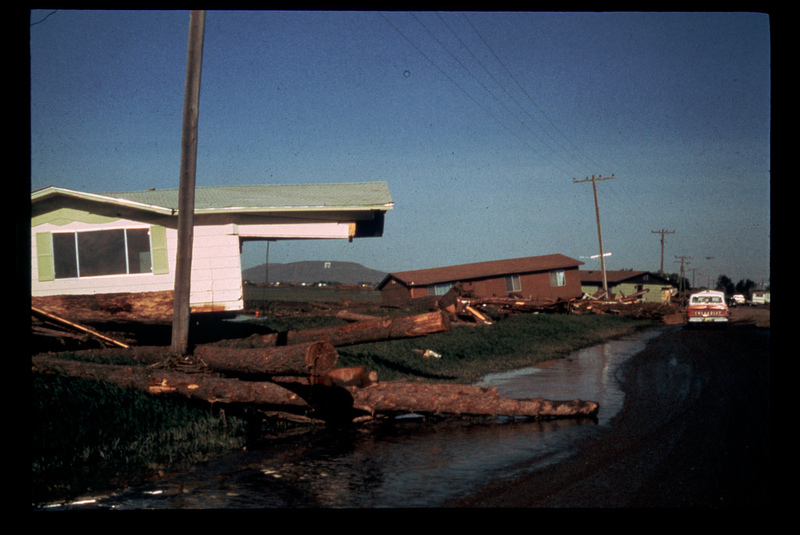 Logs were jammed up against the side of home and buildings, and many of them gave way under the pressure of the logs in the current. Businesses along the highway going north out of Rexburg were destroyed by log and water damage. The highway paving itself was pretty much gone. The first time I braved the highway north, it was just a dirt path threaded through logjams and wreckage bulldozed out of the way by a big Caterpillar. 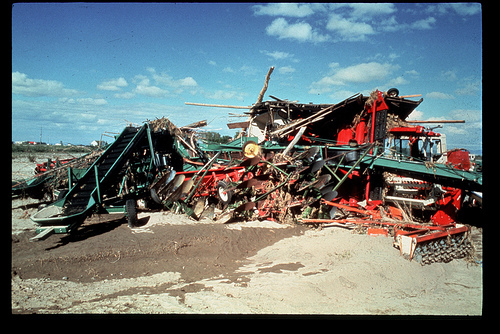 Some of the Rexburg businesses on the north end of town were farm implement dealers, and they were virtually wiped out. Most of the little town of Sugar City on the bank of the Teton River was virtually swept away in the flood. In many areas, bare foundations were left by the flood waters. 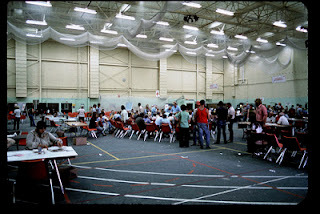 Some time later, the Bureau of Reclamation set up desks in the gym at the Ricks College campus for people to file damage claims. Turns out less than a dozen people were killed in the flood, but many hundreds of millions of dollars in property damage were sustained. 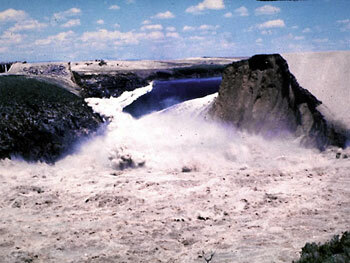 Tens of thousands of cattle and horses were killed, along with many other domestic and wild animals in the flooded area. Estimates are that the Bureau of Reclamation spent $100 million to construct the Teton Dam, then caused up to $2 billion in damages from the flood. 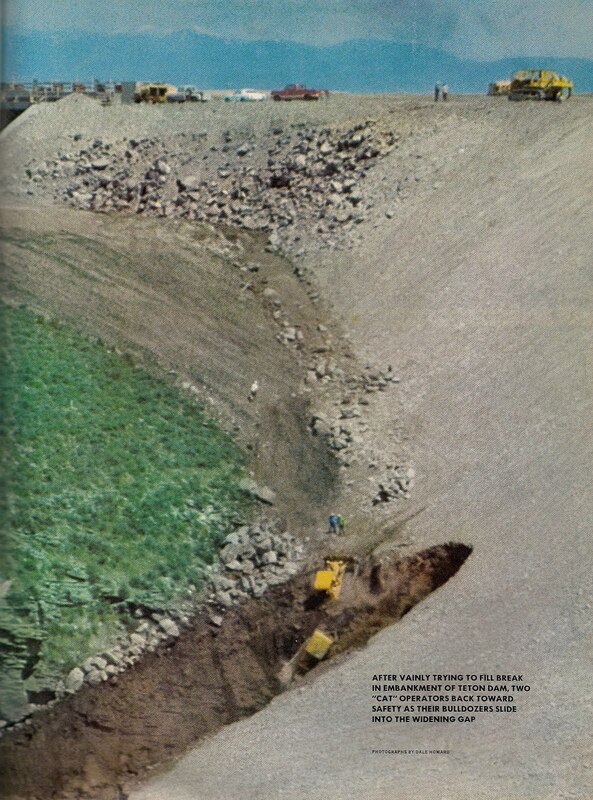 One of the most disturbing images from the flood aftermath that stays with me is a picture in my mind of thousand of animals being buried in a huge mass grave, being covered over with dirt by a massive bulldozer. 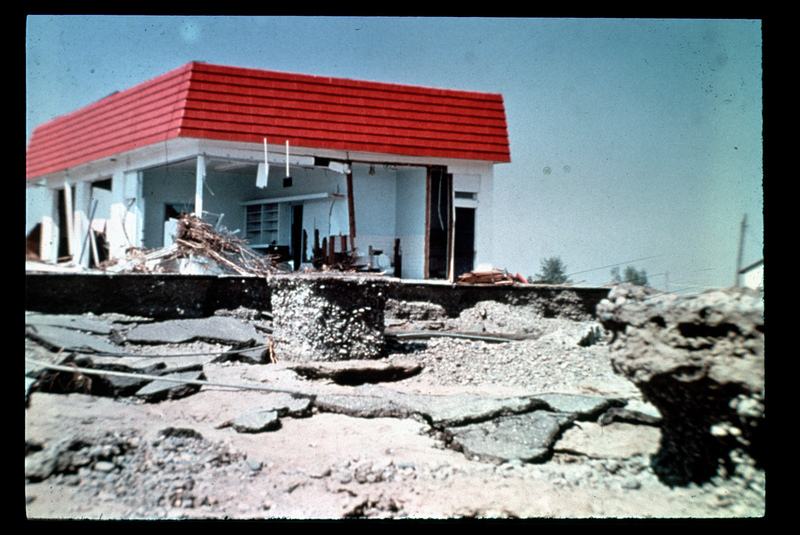 A museum was later created in Rexburg to house flood memorabilia. The museum is housed in the old Rexburg Tabernacle, which survived the flood.